The content of this website is not to be misconstrued as medical advice nor does it replace the consult of a physician or practitioner. Reader assumes the responsibility of investigating for themselves disease prevention and treatment methodologies that concur with their beliefs and understanding. The suggested protocol at the end of this page is for informational purposes and the reader assumes the risks and benefits of undertaking the protocol unless overseen by a qualified practitioner. Thiosinaminum is a homeopathic preparation of a chemical derived from the oil of the mustard seed called Rhodallin. Mustard is a spice that comes from the Brassica family of plants which contains crucifers and cabbages. This might hint at some issues with thyroid disease as crucifers like Broccoli are known to block uptake of iodine. There are many varieties of mustard, yellow, brown, spicy. There are about 40 different types of plants. It is currently grown heavily in Canada and Americans eat the most mustard of anywhere in the world. It derives from the Middle East, Africa and the East. It was used crudely in the past to cure frostbite by putting it in your socks and also used for hiccups. It can be used as an emetic. It has been used for respiratory infections and also arthritis. Mustard is made from grinding the seeds and adding other spices. 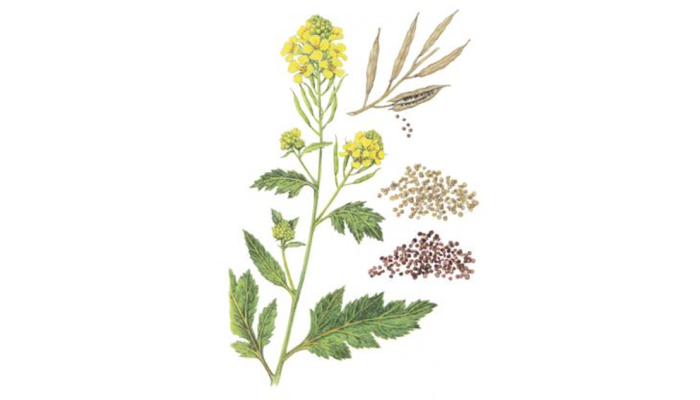 Mustard plants are green stalks with beautiful yellow flowers. A mustard tree can grow up to 30 feet high but usually between 6-20 feet height and wide. Many vineyards in California let mustard grow and plow it back in the spring to become fertilizer for the soil. This homeopathic remedy has traditionally been used to dissolve adhesions, scar tissue, tumors, and strictures. Arthritis, Spinal Stenosis, Sciatica, Ankylosis. Crisis=Pain for example constipation, or gastroparesis, or urine retention, narrowing, colic. Lymphedema might be helped but not a proven reaction. Respiratory issues like asthma or shortness of breath are a possibility. Tabes Dorsalis- spinal cord issues involvement causing neurological or walking issues. Scleroderma- hardening or tight patches of skin, or organs, cold hands, Raynaud’s, intestinal issues and peristalsis issues and gastroesophageal reflux, and heart, lung, kidney problems. It seems that this homeopathic preparation from a chemical derived from mustard seed oil called Rhodallin has solved the answer of the stage of inflammation called fibrosis. Fibrosis is caused by inflammation that remains too long or goes unchecked. Chronic injury on top of inflammation can be a factor. Pro-fibrotic factors are released from T cells, macrophages, monocytes, basophils, eosinophils, mesenchymal fibroblasts laying down collagen, cytokines such at TGF beta (upregulated in Crohn’s disease and other diseases), interleukin-4, CTGF (connective tissue growth factor), PDGF (platelet derived growth factor), TNF-alpha, IL-6, IL-1B, IL-10, IGF-1, epidermal growth factor, etc. Should these patients avoid Mustard as it could be a factor? Widely available potencies available are 6X, 30X, 6C, 12C, 30C, 200C. Many practitioners try 6X dosage twice a day for a trial of a few weeks to see if any improvement. Can be used topically for scars and keloids, etc.